John Eskate, Director of Community Services, KleinLife said, “So cook for a friend is one of the programs of KleinLife. Three generations of the Kaufman Schatz’ family have been involved with Cook for a Friend, including her mother-in-law Barbara Lipsen. “We always like to put lots of guts in our soup and lots of love,” added Kaufman Schatz. “Anytime we can give back to the community it makes us feel good that we’re doing something productive,” said Barbara Miller Schatz Lipsen, resident, Brandywine Living at Dresher Estates. “It’s a nice thing to do. We all have to give back somehow or other,” she said. 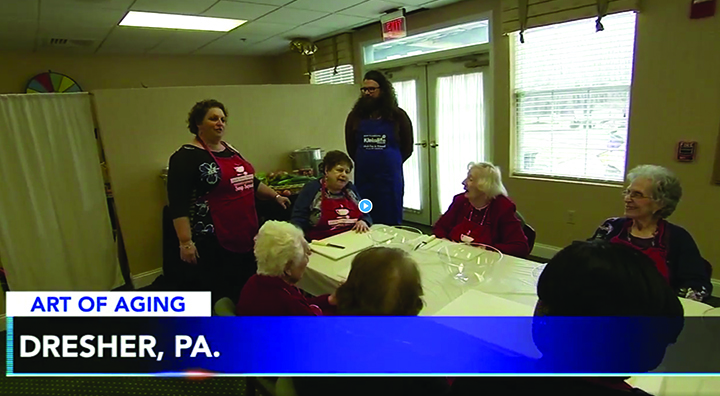 “We’re the best chicken soup makers,” added Suzi Kaufman, resident, Brandywine Living at Dresher Estates. The Dresher Soup Squad’s recipes often come from the residents, but local, seasonal produce from KleinLife’s farmers’ market also plays a role. “It’s been a really great partnership. They just make the best soup,” said Eskate.”We all sort of work together. They help me and then I can sit there and chop and dice,” said Kaufman. “And we’re really fortunate that we have the ability to do that here. So it’s a great thing,” added Kaufman Schatz.